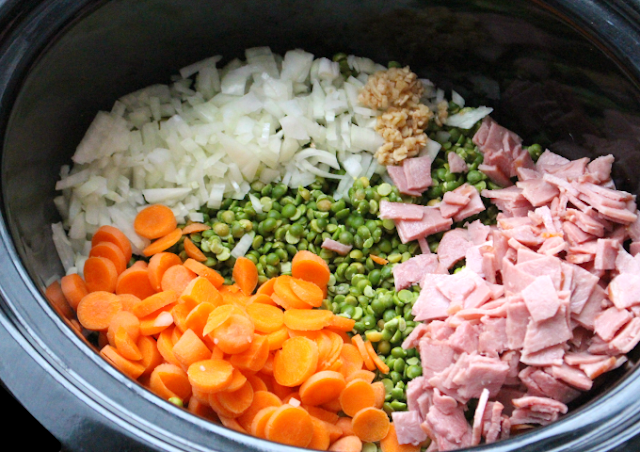 Layer ingredients in slow cooker in the order given, adding worth last. Do not stir the ingredients. Cover and cook on high for 4-5 hours or on low for 8-10 hours or until peas are soft (and if using ham bone, ham falls off the bone). Use emulsifier to blend ingredients together until you reach desired consistency. I usually serve with Pineapple Sausage that I grill on the barbecue. It gives an excellent contrast to the soup that the family really enjoys. This is the perfect rainy day meal.Hubby Rating: 10! This is one of his favorite rainy day meals...this along and the corn chowder soup. That is DELICIOUS (I will be sharing that recipe soon!). Happy eating! Typically I discover websites through the remarks that different bloggers leaves on those web journals thus it adds to it just to indicate distinctive styles and thoughts. I have picked this specific site since It gives assistance to individuals to make them feel sure on the web, to know they are welcome to join the discussion and give their assessments. It's vital that they know how the structure of online journals workout.Feel free to surf custom essay writing service for new essay writing ideas.